Thu, Mar 22, 2018, 07:51 pm SL Time, ColomboPage News Desk, Sri Lanka. Mar 22, Colombo: Sri Lankan President Maithripala Sirisena after undertaking an observation visit to the Muthurajawela Sanctuary today ordered an immediate halt to all construction and land reclamation activities within the sanctuary which could result in the destruction of the environment surrounding the diverse eco system. The President has ordered to revoke all the permits that has already been given by any government organization to fill any lands around the area, President's Media division said. The President has instructed relevant authorities to take disciplinary actions against the government officers who have already sponsored such acts which pollute the environment or those who are still giving assistance for such harmful actions. 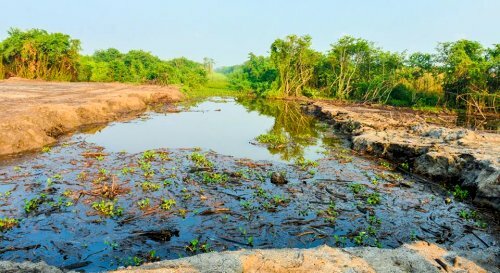 Recently there were repeated media reports on acts of environmental pollution that was occurring near Muthurajawela Sanctuary which is a vital wetland in Sri Lanka. In view of these reports, President Sirisena made a deep study on this issue and undertook an observational visit around the place around dawn today (March 22). The President said that even a land with ownership deed, permission should not be granted for constructions or land filling, if there is an adverse effect on the environment. If there is any political influence behind such acts he would not hesitate to take immediate action them too, he said. 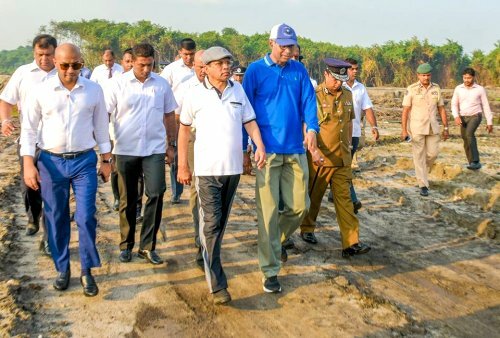 Ministers Patali Champika Ranwaka, Duminda Dissanayake, and Inspector General of Police Pujith Jayasundera participated in the tour with the President.